I just took the Strong Life Test for Women. This test was designed by strengths expert Marcus Buckingham for women the LEAD ROLE and the SUPPORTING ROLE they were born to play. Here are the results of the Strong Life Test I took yesterday. I am sensitive to how everything in the world is connected, how movement in one part of the world causes everything else to move as well. Alive to this inter-connectedness, I feel compelled to keep everything aligned. Any job where I'm paid to speak up for people who’ve been wronged. In virtually every situation, my eye goes to the outcome. 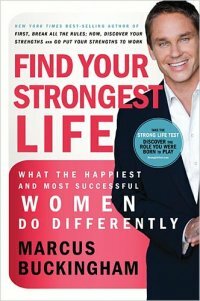 I am, to this day, completely amazed how "strength strategist" Marcus Buckingham can formulate test questions and accurately define people's strengths. My Equalizer Lead Role wonderfully describes my moments in my past where I felt were my strongest ones. I have had several incidents in my past where I stood up for misunderstood people (usually my friends) or people who are victims of bullying (living in a city where there is a distinct and obvious social stratification, this has happened a lot). However, I am still not convinced (or maybe I am still in denial!) that I am an Influencer. Do I love outwitting others (never liked it)? Do I find satisfaction in closing a sale? Yuck. But I will give it a chance and see if Buckingham's test results are true. What I learned from the book "Find Your Strongest Life" by Marcus Buckingham and will apply right away: start listing down my "strong" moments. Bring a notepad and pen right away. Will start focusing my energies on my strong moments instead of attempting to live a perfectly balanced life. Take the Strong Life Test. It's free. No access codes necessary. Evaluate your Lead and Supporting Roles. Grab a copy of the book. I strongly recommend it because you will get fantastic tips on how to maximize your roles. And when you know where you are strong, your life becomes more purposeful. And when it is more purposeful, you experience freedom from engaging in tasks that you feel weak in. And there is nothing like freedom from having to do the things that you don't like! What a beautiful site! I'm bookmarking it. Lovely blog, recommendations, everything. I took the Strong Life Test, too -- I'm a Creator and Advisor -- and I feel incredibly strengthened, empowered to live those few empowering moments as often as I can, to increase those moments as fully as possible.